The Cube iWork 1X is a tale of two products. On one hand, it offers great value and very decent hardware with the added bonus of Android 5.1 alongside Windows 10. On the other hand, the keyboard is optional and the battery life could be improved. When it comes to tablets or laptops, the bare minimum you should be looking for to run Windows 10 comfortably is a quad-core (or quad-thread) device with 4GB of system memory and 64GB on-board storage (eMMC is okay, but preferably SSD). 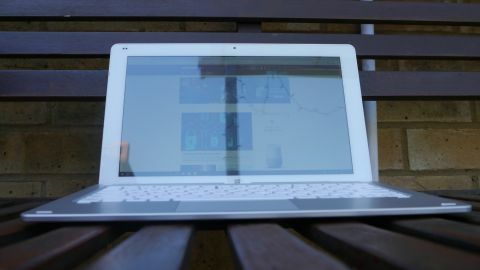 Cube, a newcomer to TechRadar Pro, unveiled the iWork 1X at the beginning of the year. This 2-in-1 convertible laptop was the first one to come with the Intel Atom X5-Z8350 processor, a slightly improved version of the Z8300, one of the most popular CPUs of 2016. This device fulfils the three aforementioned requirements for running Windows 10 decently and does so with a price tag of just over £150 (around $190), making it one of the cheapest Windows products to pull off this feat. Online Chinese retailer, Gearbest, sent us the sample and sells the Cube iWork 1X for only £151 (around $190) – although a flash sale could bring it to as little as £113 (around $145). Note that, while this price includes delivery, it is exclusive of any taxes that may be levied by HMRC or the courier companies on behalf of the vendor. Want to buy tech from online Chinese retailers? Read this first. The Cube iWork 1X is essentially a Windows tablet with an optional keyboard at a price point that’s similar to what netbooks were selling for. The form factor is a well-known one: a slab of glass and metal with a thick white bezel (up to 21mm) around the display, plus some inscription in Chinese on the back together with the AllDoCube logo. At 298 x 180 x 9mm and weighing 762g, it is fairly chunky for an 11.6-inch tablet. The good news, though, is you get plenty of ports including a microSD card slot, a micro-HDMI connector, along with a microUSB that doubles as the power connector, plus there’s a full-size USB 3.0 port. A rocker volume button, a power button and a pair of tiny speaker grills can be found on the sides of the iWork 1X. Other than the Windows button on the front, there’s a webcam (2-megapixel) plus a status light that comes to life when charging the device. The optional keyboard is mostly made from plastic and magnetically attaches to the tablet; the latter connects via a 5-pin POGO port. There are two USB 2.0 ports, one on each side of the device, and unlike some rivals, it doesn’t come with an integrated battery. Don’t expect any miracles from the iWork 1X – the main selling point of this Cube product is its value for money, not its use of top-end components. As mentioned earlier, it runs with an Intel Atom X5-Z8350, a quad-core 14nm processor that has a base/burst frequency of 1.44GHz/1.92GHz, with 2MB L2 cache and integrated Intel HD Graphics 400. Also part of the package is 4GB RAM clocked at 1600MHz, along with 64GB eMMC storage. The IPS display is an 11.6-inch model with a Full HD resolution, a rarity at this price point. An 8,500mAh/8.2Whr battery and Windows 10 Home power the iWork 1X tablet. The charger is a 10W (5V, 2A) model which means that you should be able to use your bog standard power bank/laptop charger to power it.